A three-week trial at Blackfriars crown court has ended and 11 prisoners have been acquitted of mutiny and criminal damage. The charges followed an incident at HMP High Down, a category B prison in Surrey, in October 2013, when the men barricaded themselves in a cell and demanded to see the governor. After hours of negotiations, a riot team stormed the trashed cell and ended the protest. On the mutiny charge, the jury undoubtedly returned the right verdict. It is a serious crime. These men were indicted with “engaging in conduct intended to further a common cause of overthrowing lawful authority” at the jail. Excuse me; the men barricaded themselves into one small cell, crammed like sardines. How would they overthrow the regime from there? On the criminal damage charge, it seems a surprising verdict to acquit them – the jury was clearly in sympathy with the defendants. What is more shocking is that there was no word in the national press of this trial and the verdict. I was alerted to it by blogger Alex Cavendish who blogs atprisonuk blogspot and the comprehensive coverage in the local paper. “Barricading up” is a common form of protest in jails. Cells are small and prisoners can easily use beds and other furniture to block access. In prison, I barricaded up twice. Both times, I was, correctly charged with disobeying a lawful order to remove the obstacles. On both occasions, I was dealt with by the prison governor and incurred sanctions. That route was open to the High Down governor, or he could have asked a district judge to come in and adjudicate. The judge could have given the men an extra 28 days inside. But this matter was taken out of the governor’s hands. The decision to charge the men with mutiny was taken by the Crown Prosecution Service, but it it is hard to imagine that justice secretary Chris Grayling was not involved. Perhaps he thought jurors would have been appalled by prisoners defying authority and convict them. If so, he has scored a spectacular own goal. The prisoners were complaining that the quality of their lives had reduced dramatically after High Down was chosen to pilot a policy “New ways of working” aimed to make prisons more “meaningful”. In effect, it was a cost-cutting exercise. Staff were cut and prisoners spent longer in their cells during the day. Prisoners’ association time was cut. Prisoners use the telephone during association and they would not have taken kindly to having this vital link to the outside world restricted. 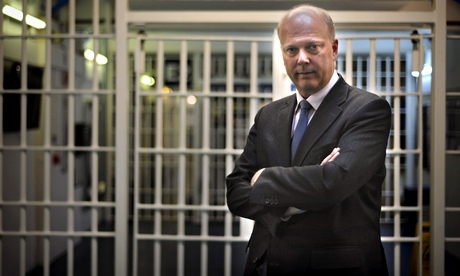 The punitive policy smacks of Grayling. The governor of High Down, Ian Bickers, told the court the changes were “not of our making. They were forced on us. We were trying to implement the new policy, which was done wrong by headquarters,” he said. Post-trial, former prisons minister and local MP, Crispin Blunt, said in view of the governor’s evidence the acquittal was unsurprising and he questioned why the prosecution was brought? The smart money says it was orchestrated by Grayling, this incompetent minister, who refuses to take advice from people with experience of the penal system. High Down is probably best known for running The Clink restaurant for staff and visitors which provides training for prisoners who may want to work in the catering industry after release. But eEarlier this year, a report by theIndependent Monitoring Board at the prison said 2013 had been a “dreadful year” for the jail and the changes had produced “an unhappy prison”. Grayling didn’t listen, he never does.